The following are several fakes that you should be aware of if you spend any time on the internet buying gold nuggets. These fakes range from "downright pathetic" to "not too bad", but all of them have tell tales signs that will prove they are not authentic. There are other fakes out there, but these are probably the most common ones that you will run into. Most prospectors and gold collectors who have handled a decent amount of natural gold can usually tell the difference quite easily, but if you are a beginning gold collector you should pay careful attention to avoid some serious disappointment. Cast Lead- Much like the copper nuggets, there are nuggets of lead that have been gold plated. These two nuggets look awfully similar, don't you think? I came across these a couple years ago. They are literally cast from the same mold, EXACT replicas of each other. I simply took a pair of pliers and snipped off a piece of one of them to expose the obvious lead core. Although they didn't look very real, they were fairly heavy since they were made from lead. They had a very unnatural shiny look, and were oddly shaped as well. Man Made Gold Nuggets- These are gold nuggets that are not natural, but have been manufactured by someone. They are made using real gold that has been melted and formed into the shape of a nugget. 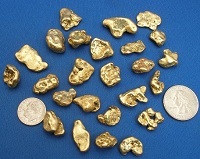 Not only are these gold nuggets not natural, but the purity of the gold is a mystery unless you test it. It may be made from scrap jewelry, placer gold dust, scrap dental gold, etc. I think a more accurate description would be to call them gold "slugs" or "buttons" rather than a gold nugget, since most people consider a nugget to be a naturally formed piece of gold. These "slugs" can be made using a variety of methods, but the end result are pieces of gold that will look and feel like a natural gold nugget to the uneducated observer. 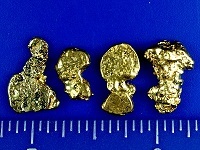 Since these are made using real gold, an electronic tester, acid test, or even a specific gravity test may not differentiate the difference between a real and man-made nugget (the exception would be if they were made using gold that has extremely low purity, less than 14k would certainly be a red flag). There are even fake specimen pieces out there that are pieces of quartz that have gold poured in the cracks to look like natural veins of gold. These can look very realistic and have fooled a lot of people. Much like the other fakes we have discussed, an experience gold collector will probably notice right away that it not quite right. The safest way to avoid these fakes is to obtain a good relationship with a reliable gold supplier who you can trust. Iron Pyrite- also known as "fool's gold", is relatively easy to differentiate from real gold. 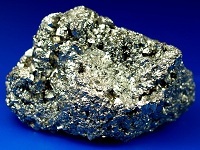 Pyrite has a pale brassy coloration, and will generally have several crystals bunched together. Pyrite is much harder and more brittle than a gold nugget. Pyrite can form in cubes, pyritohedrons, and octahedrons. It often has a mirror like finish that acts as a reflective surface when held under light at various angles (like a disco ball). Look as some pictures of pyrite as well as natural gold nuggets, and you should have no trouble telling the difference between the two. Something to always keep in mind about gold which can help you with your identification... Gold is HEAVY. If you have any experience handling gold nuggets, you will notice right away that the fakes just don't feel quite right... Gold has a specific gravity of 19.3g, in other words it is 19.3 times heavier than the equivalent volume of water. Copper has a specific gravity of 8.9, lead has a specific gravity of 11.3, and pyrite has a specific gravity of around 5. It may LOOK like a gold nugget, but is won't FEEL like a gold nugget. A simple acid test kit will also differentiate the fake gold nuggets from the real thing. They are used by jewelers, coin shops, or anyone who buys gold on a regular basis. They are used to tell if a piece of gold is 10k, 14k, 18k, 22k, or just plated with gold. If the test is done correctly, these will clearly distinguish between a real gold nugget and something that has only been plated. They may NOT be able to tell the difference between a real nugget and one that was mad-made using melted down placer gold. However, many of the man-made nuggets are made from lower grade 10k and 14k alloys, which are a dead giveaway that your nuggets is not natural. The best advice I can give is to buy your gold nuggets from a trusted source; direct from the prospectors who found the gold, or businesses who have good reputations selling gold nuggets. Common sense is the key, remember that a price that seems too good to be true probably is. A few comments on eBay... there are lot of gold nuggets on eBay, unfortunately there are lots of FAKE gold nuggets on eBay as well. I have bought and sold a lot of gold on eBay over the years, and most transactions are smooth and hassle free. However, I would warn then uneducated buyer that there is a lot of risks out there. Be sure to check the sellers feedback rating (not only the percentage of positive feedback, but the detail star ratings as well, and read the detailed comments from past buyers). Look at WHAT the seller has sold in the past. Think about it, if they have a good feedback rating, but all they have sold is pez dispensers, do you really trust that persons expert opinion when it comes to gold nuggets? The majority of sellers are not trying to scam you, but realize that many of the sellers may have been duped themselves. Maybe they bought a fake nugget several years ago and decided to resell it, assuming that it is authentic. Simply put, buy from a trusted, knowledgeable, and reputable source, and you will avoid the risks and hassles. Hopefully this article has provided some valuable tips and information. Feel free to link to this article, and if you have any info that you think would be valuable, please contact me and I will be glad to add anything that would help educate buyers to safely buy gold nuggets.